Shakespeare WA are presenting Much Ado About Nothing for the first time in Kings Park in 8 years! Shakespeare WA’s new production of Much Ado About Nothing is set locally in Western Australia, at the end of the Second World War. A ‘Shakespeare meets Dad’s Army’, this hilarious war of the sexes is currently delighting audiences with its mixture of star-lit romance, scheming rogues, and the silliness of the home-guard. Our fun-filled and uproarious comedy is presented at Kings Park and Botanic Garden under the artistic direction of Paige Newmark. The cast features the award-winning actress Hannah Day, who is newly arrived from Scotland to play Beatrice, as well as David Davies, who returns to Perth to play Benedick after working with the Bell Shakespeare Company and running his own GB Shakespeare Company in the UK. WA audiences will be delighted to see Sam Longley once again performing at Shakespeare in the Park as the hapless Dogberry, along with a host of Shakespeare WA favourites, Stephen Lee, Sean Walsh, James Hagan, Claire Munday, and Nick Maclaine. We are pleased to welcome Garreth Bradshaw from Upstart Theatre and Marko Jovanovic, as well as newcomers Geordie Crawley, Sophie Lester, and Jordan Holloway to this year’s production. As in past years, our production is designed to appeal to both the classical theatre market and Shakespeare-newcomers alike, as we seek to keep the plays as fresh and relevant as they were when first performed 400 years ago. 2) An audio described performance for the Association for the Blind of WA, including the blind and visually impaired community. Shakespeare WA is thrilled to be continuing its partnership with Australian energy company, Santos, which has extended its long-term support of the arts in other parts of Australia and is now making a difference to the cultural life of the WA community. This season is made possible through its generosity. Shakespeare in the Park is a smoke-free event proudly sponsored by Healthway promoting the Act-Belong-Commit message. 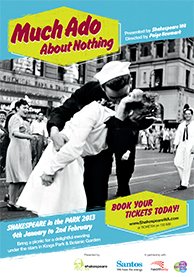 Much Ado About Nothing runs 4th January – 2nd February 2013. All performances begin at 8pm with the box office opening at 7pm (no performances on Sundays or Australia Day, Saturday January 26th). To pre-purchase tickets and avoid missing out please visit our tickets page. For more information please contact us at Admin@ShakespeareWA.com.